There are times when we want things a little more hands-off, a little more reliable, whether it's because we're getting ready for a big party and don't want to risk screwing up that pork, or if we're busy weekday workers who still want to be able to come home and pull off a batch of pulled pork before bedtime. Not only that, but using a sous vide cooker to cook pork shoulder can allow you to achieve textures you can't get with traditional cooking methods. 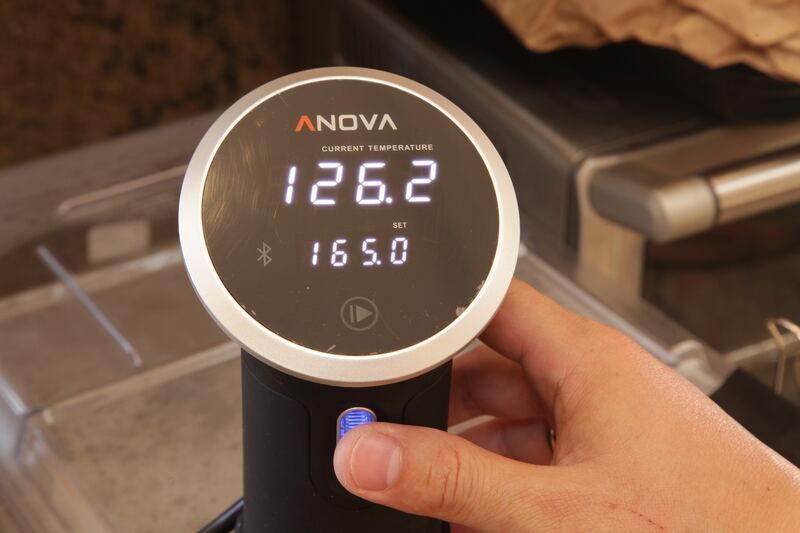 Who knows, we may even want to cook sous vide pulled pork just because we have sous vide cookers and we must play with them. I know the feeling. Set the temperature on your Precision Cooker to 165°F / 74ºC for pull-apart tender pork, or for 145°F / 63ºC for pork that is tender but still sliceable. OPTIONAL: While your sous vide bath heats, create your rub. 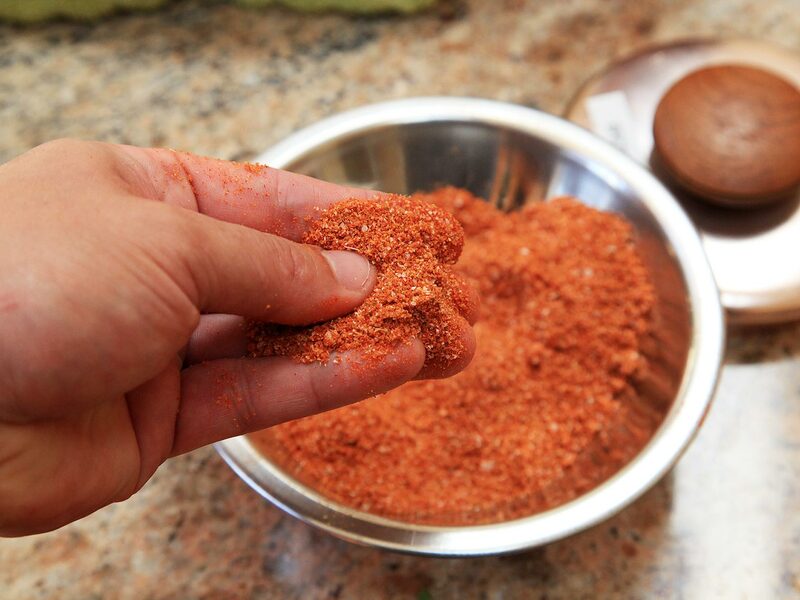 Working in batches, combine paprika, brown sugar, salt, mustard seed, black pepper, garlic powder, oregano, coriander seed, and red pepper flakes in a spice grinder and reduce it all to a fine powder. 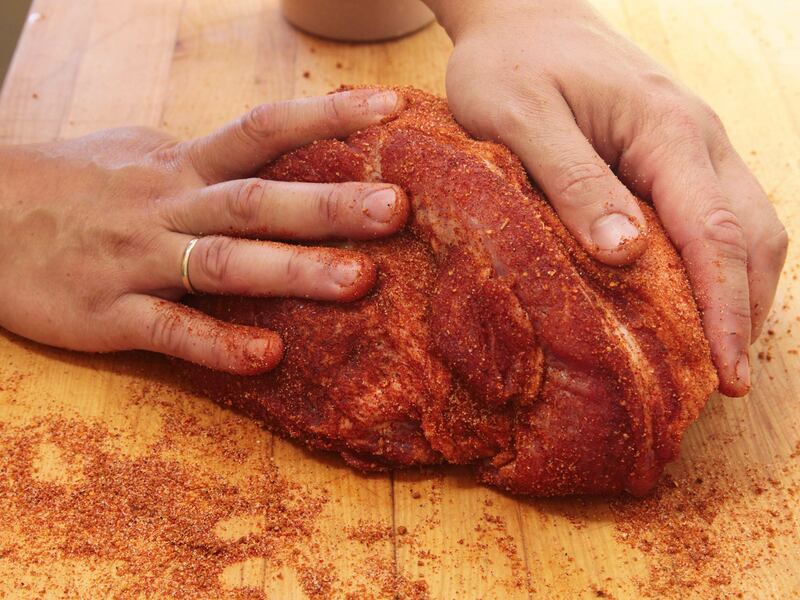 If you'd like your pork shoulder to have a pink smoke ring, add a quarter teaspoon of pink curing salt (Prague Powder #1) to your spice mixture. Before applying the rub, set aside 3 tbsp / 35g of the mixture, you'll use that to re-rub your shoulder before finishing. Rub the remaining mixture generously all over the shoulder. 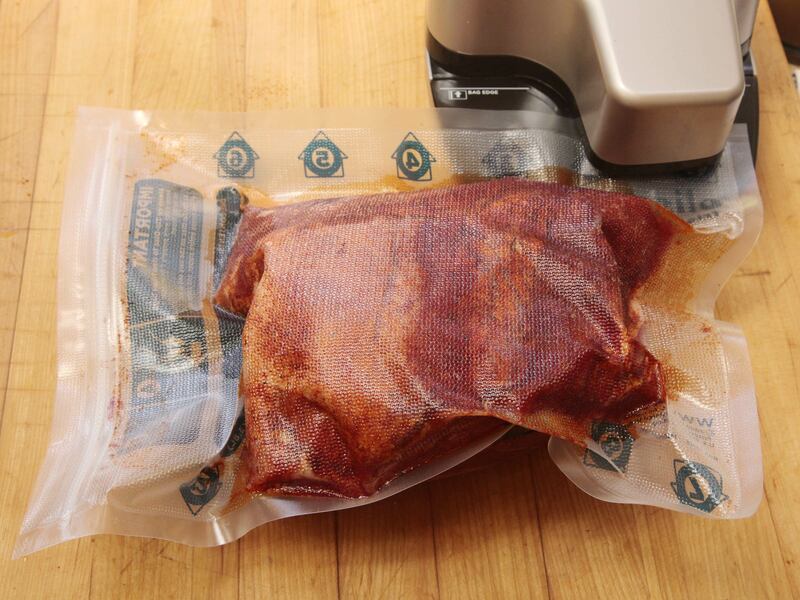 Seal the bag either using a vacuum-sealer or, if using a zipper-lock bag, by using the displacement method. To do this, seal all but the last inch of the bag, then slowly lower your bagged pork into a pot of water, letting the pressure of the water press air out through the opening of the bag. Seal the bag just before it completely submerges. It should be completely air-free. 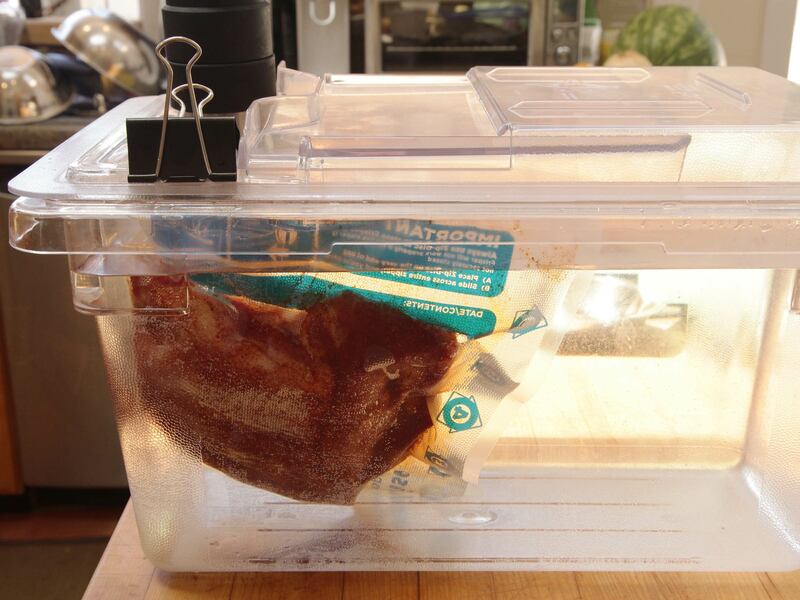 Drop your sealed pork into the water bath, set a timer for 18 to 24 hours, and relax. For extended cooks like this, it's a good idea to cover the top of the container with foil or plastic wrap to prevent excessive evaporation that could lead to the circulator shutting down due to low water levels. Once the pork is cooked, you can chill it and refrigerate for up to a week before continuing, or just continue straight into the finishing steps. 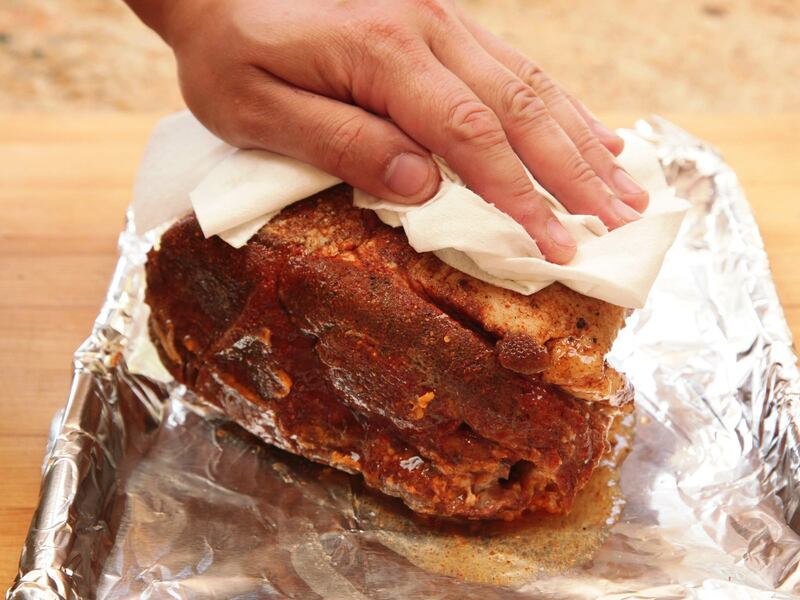 The first thing to do is get rid of excess moisture by removing the pork and patting it down thoroughly with paper towels. If desired, you can take the juices in the sous vide bag, add them to your favorite barbecue sauce, and reduce it over the stovetop to give your sauce extra porky flavor. 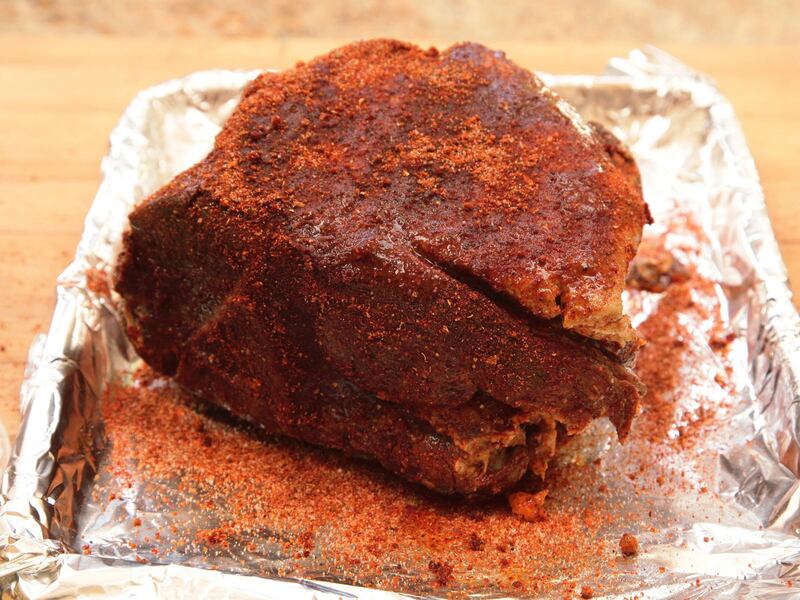 The first sprinkling of rub did a good job of getting flavor into the pork. 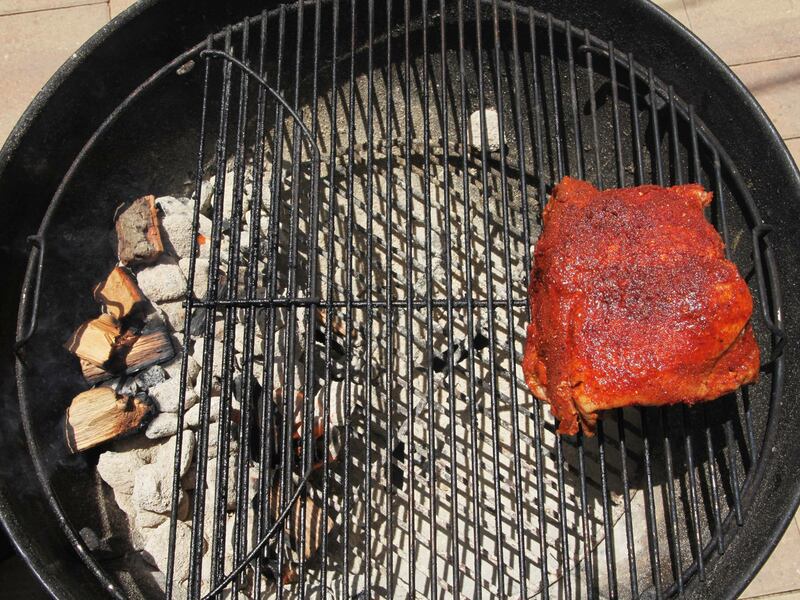 A second coat of rub now gives you a good foundation for building up that crunchy, dark, flavorful bark. 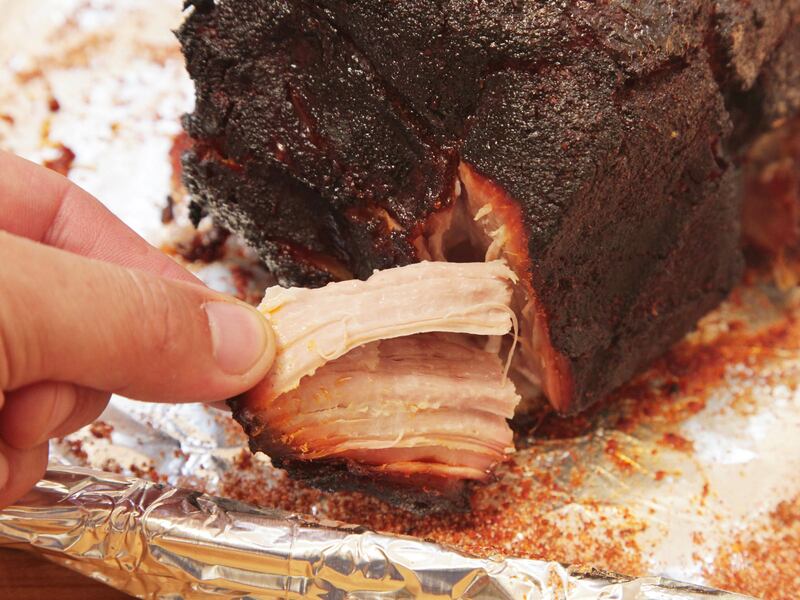 Place the pork on a foil-lined rimmed baking sheet with a wire rack placed in it. 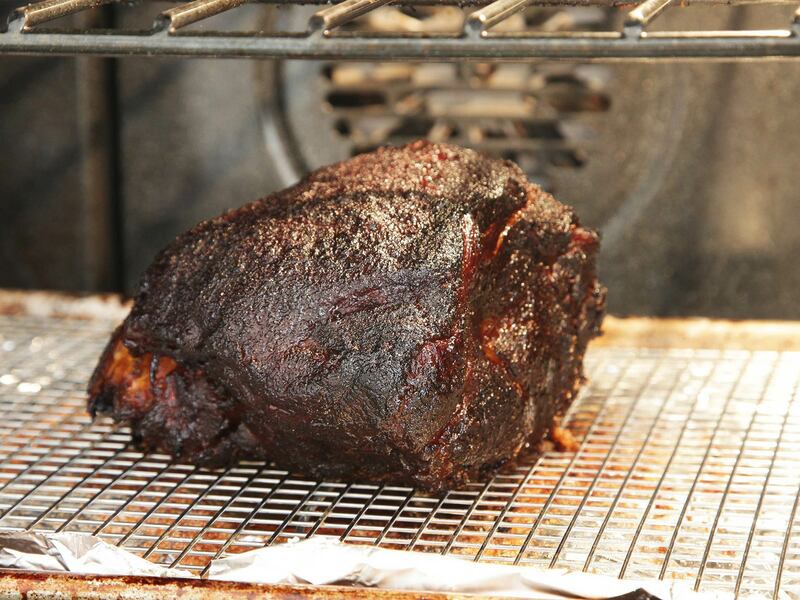 Set it in a preheated 300°F / 149ºC oven and cook until the exterior achieves a dark, mahogany bark, about 1 1/2hr. Remove from the oven and continue to the next step. The meat is ready to be pulled! I find this easiest to do with two forks, but if you have heavy duty plastic gloves to protect your fingers from the hot meat, then by all means go right in with your hands. I like to shred apart into big, tender chunks, but you can also transfer the shreds to a cutting board and chop it more finely with a cleaver or chef's knife. Note: If cooking the 145°F / 63ºC version of the pork, you won't be able to shred it, you are better off slicing with a knife. 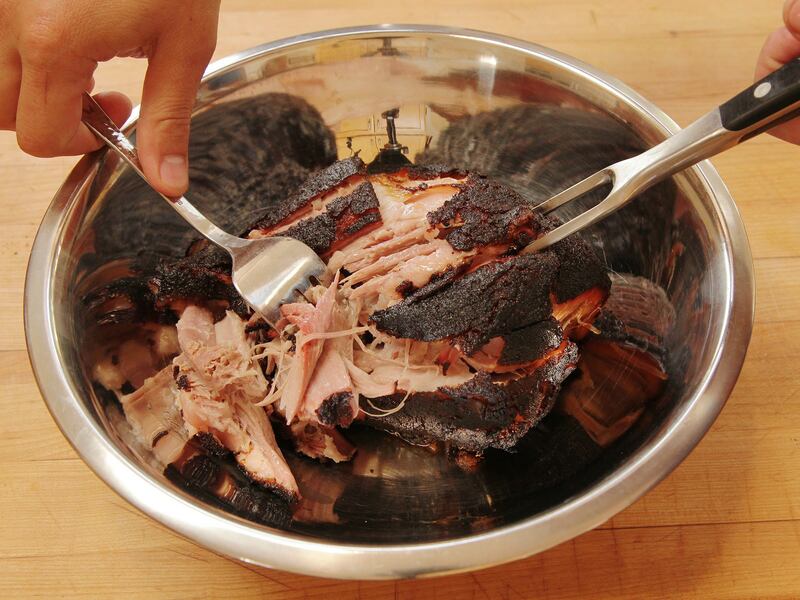 Once the pork is shredded it's ready to serve with your favorite barbecue sauce. 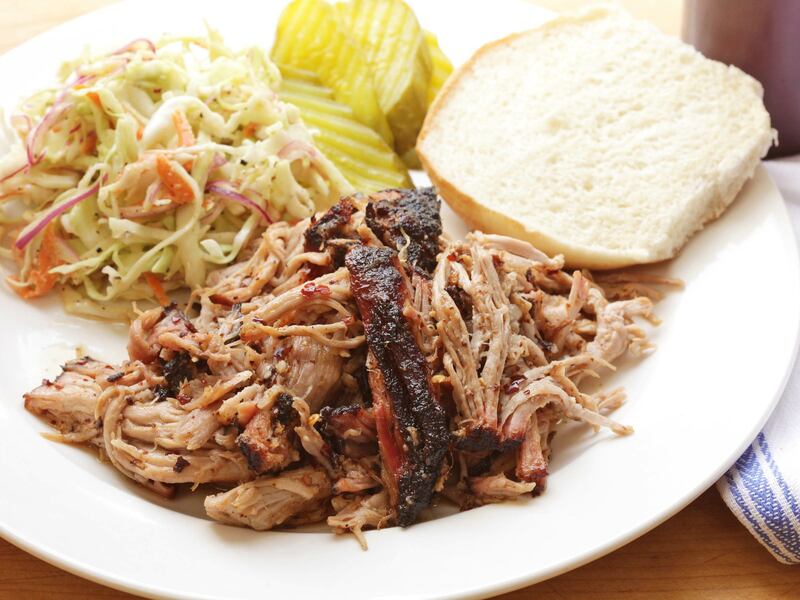 Pair it up with some pickles, some creamy cole slaw, and a soft bun and you've got yourself the makings of a fantastic meal. To finish your shoulder over live fire, light up a smoker and set it to 300°F / 149ºC, or ignite a half chimney of coals, and spread them out over half of the coal grates. 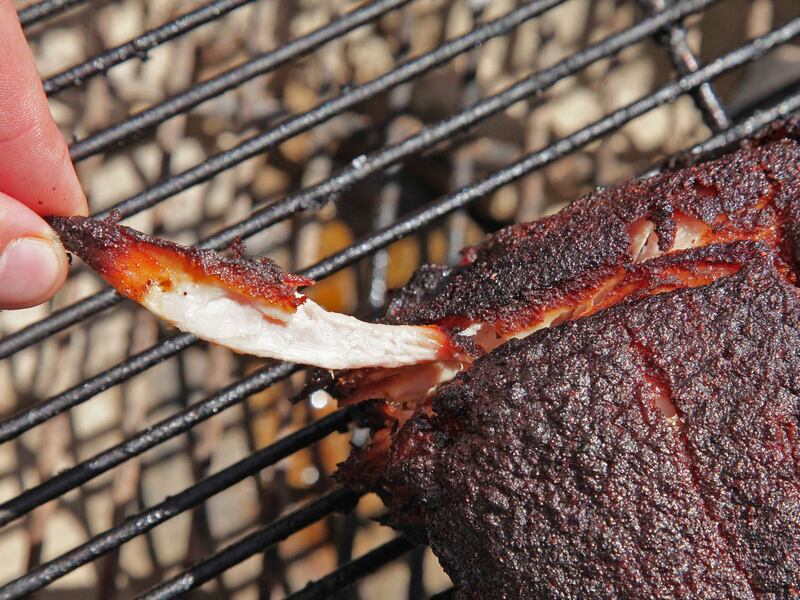 Add a few chunks of hardwood (no need to soak it) and as soon as it begins smoldering, place the pork in the smoker or on the grill, away from any indirect heat. 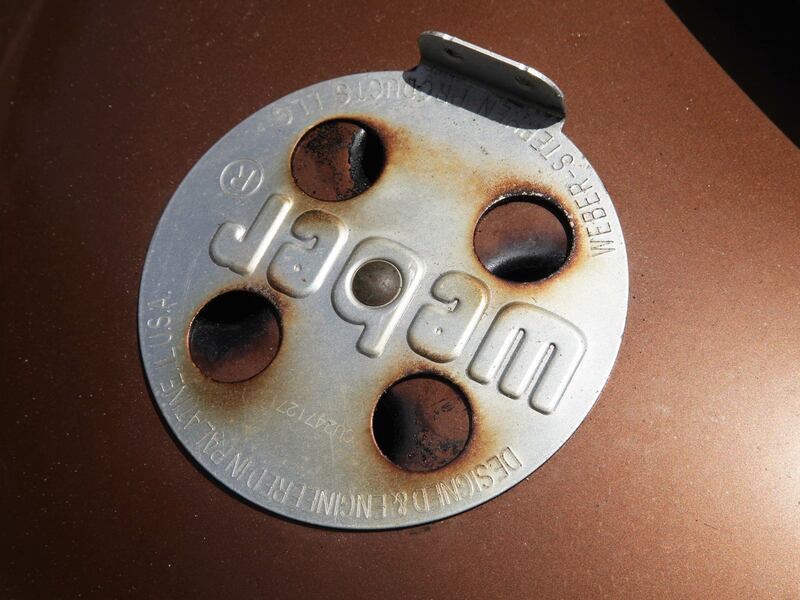 For a gas grill, light up half of the burners and leave the other half switched off. Place the wood chunks in a foil boat directly over the hot side of the grill and place the pork over the cooler side. Cover and cook, adding a few pieces of wood and coals as necessary and maintaining the air intake valves to try and keep the cooker hovering at around 275 to 300°F / 135 to 149ºC at all times. 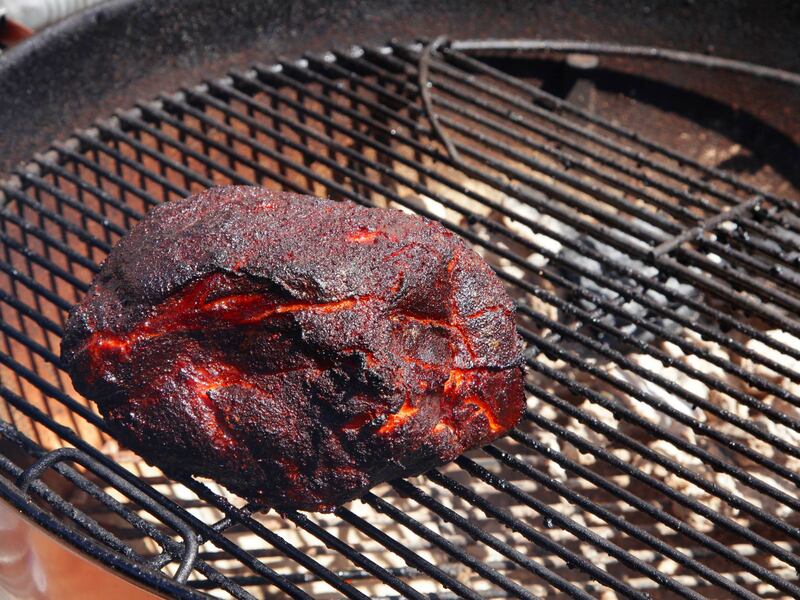 Keep cooking until the pork has achieved a deep, dark, mahogany crust and pulls apart when you pick at it. This will take about an hour and a half to two hours.